Villa Alexi a waterfront villa, furnished with Antiques collected in China and Tibet. Infinity pool with a direct ocean view, super large bedrooms and very unique decor that you will enjoy as you relax to the sounds of the ocean's waves below. The kitchen was designed by my husband who was a professional chef in USA and France. The furniture was collected in northern China and Tibet. As a Realtor the design of the house incorporates everything that people want: view, ease of living, comfort, elegance and the mysteries of the antiques. As you gaze at the ocean and look at the formations of the rock outcroppings, you will see our daughters' secret hot pool - freshly washed by the ocean every hour, warm and relaxing. The portraits in the house represent some of the minority women of southern China, with their unique and exotic head dresses. We have discounted car rental rates available for villa guests !! April and Shannon , my wife and daughter on the left at the Memorial day Fishing tournament from St. Thomas to Anegada B.V. I. 2013. My daughter caught the biggest dolphin, 33.25 lbs. Alexi is totally private with a knockout view as you enter. 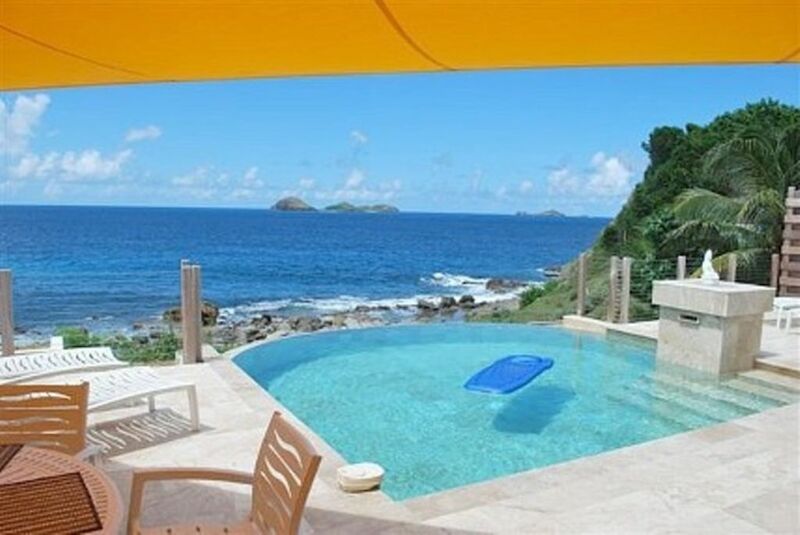 Infinity pool ocean front and wonderful views of the islands, St. Martin, and Anguilla too. The villa is charming, quiet peaceful setting with the sound of the waves ever present. My family has been coming to St Barts for almost 30 years. This is the first time we have stayed on Anse des Lezards. The location of this villa is great. Private, quiet and right on the ocean. We had a wonderful vacation. Even comes with a tortoise! What a value... private and great service. Perfect for naturists!!! Just finished 15 glorious days at Alexi. This is our 4 stay at Alexi. It's location is perfect to the beaches and Gustavia. Highly recommend this villa. thanks for the kind review and hope you will return next season for visit number 5 ! The location of Villa Alexi right next to the crashing waves, with a stunning vista from every room, made it an absolutely therapeutic and relaxing oasis. We lounged by the pool and had little motive to leave despite the fun to be had elsewhere on the island. Thanks Byron! $3500-$10,000 depending upon time of year and bedrooms needed $3500-$10,000/week depending upon the time of year. Inquire for the Christmas/New Year rates. High Season .. Dec 15-Apr 15. Low Season ... Apr 16-Dec 14. Contact me for last minute booking rates!! !